Happy New Year everybody! 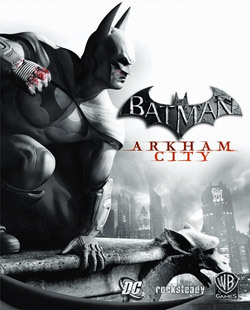 The holidays are behind us and I had the time to play some games including one that I’ve been very much looking forward to called „Batman: Arkham City„. Now, I haven’t written a review about it’s predecessor, but of course I played Rocksteady’s first Batman game „Arkham Asylum“ and did so with great pleasure, as it’s a hefty piece of gaming art. Story in short: When Batman delivers the Joker to the front porch of Arkham Asylum, where all the manics of Gotham City are kept, he wittnesses how the Joker breaks free and all hell breaks loose with Arkham overrun by its inmates. In the game Batman needs not only find the Joker, he also needs to defend himself against Bane, Scarecrow, Poison Ivy and other villains along with hords of freed prisoners. In the end he manages to capture the Joker and get Arkham under control but it’s hard work (for the player) as well as great fun. The game was a big success even to the critics and featured a lot of interesting treats for fans of the Dark Knight. Now about 18 months after that the sequel kicks in. There is a series of comics to tie in with the game ([amazon_link id=“3862012212″ target=“_blank“ ]Batman: Arkham City[/amazon_link]), telling some of the backstory: The head of Arkham Asylum named Quincy Sharp has, relying on the fact that he „managed“ to get Arkham back under control after the forementioned events, stepped up to become mayor. Promising he’s going to clean the streets of Gotham once and for all he wins and since police forces are overwhelmed by crime his plan is to cut of a hude area of Gotham, completely conseal it and bring all criminals currently in Blackgate prison or the highly dangerous Arkham Asylum to this place that he names Arkham City. Inside the area they’re free to do as they wish while a private army called TYGER patrols the walls to make sure nobody leaves (or gets in, as is also revealed). From the get-go Batman suspects that there is a larger plan involved with the undertaking and that Sharp is only a marionette in this. 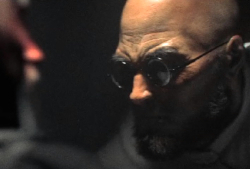 And in fact he reveals (just as it’s publically announced though) that Arkham City will be run by Dr. Hugo Strange. Sounds Strange? Well, it’s going to be. When Bruce Wayne, who opposes the Arkham City plans throughout, gives a press conference in front of Arkham City (kind of stupid, no?) when it’s opened, he is captured and brought inside. Hugo Strange found out about his secret identity and rather than fighting Batman decided it would be easier this way. Well, of course Wayne escapes his imprisonment (kind of) climbs a roof and orders Alfred to send a suit. After that Batman is captured inside Arkham City and starts getting to know the neighbourhood. First he frees Catwoman from the hands of Two-Face, then he learns that the big grin is ill because of the Titan-formula from the last game, going to die. Getting too close to the Joker, he is knocked out and Joker injects him some of his blood to make „Bats“ look for the cure that Mr. Freeze could provide. To strengthen the motivation Joker has also send his blood to numerous hospitals in Gotham. Now it’s a race against time not only because of the Joker plot but because Strange announces to unleash „Protocol 10“ in about 10 hours. It’s unclear what that brings, so we’ve got to find out. The first game introduced a simple yet powerful fighting system, as it can genre-wise be considered a Beat’em’up/Puzzle-Adventure, and so one of the main things the player needs to deal with is hand-to-hand combat with up to a dozen burly thugs. This is easily done with two mouse buttons and and a few keys. You’re supposed to create a long chain of Kicks’n’stuff to add up through combos, thereby earning yourself experience points to level up and improve your gear with Waynetech upgrades. Because you never change a winning strategy all those things are back. 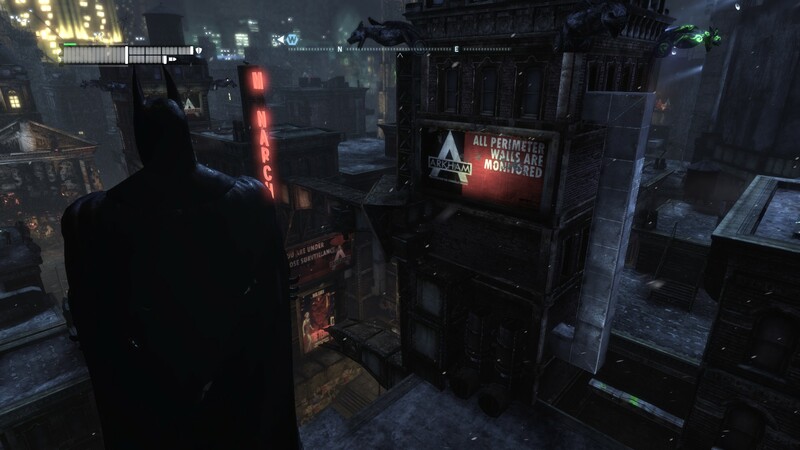 Because Arkham City is fully open from the beginning there are side quests along with the main objectives and, like in the first game, lots and lots of riddles all over the map. 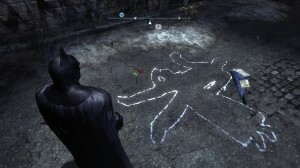 You can find Riddler-statues, special locations and kidnapped people to free. Plenty of stuff to do. Batman starts out having most of the tools from the previous game but gets new ones at certain story points. Detective mode is also back, granting the ability to see hidden items and through walls. It also comes handy when there is a room of (possibly armed) goons you need to take out silently and quickly. After the combat scenes those stealth challenges are the second common scenario. Third are the boss fights which involve either modified henchmen or main villains. Those are interestingly hard but manageable once you found the matching attack. 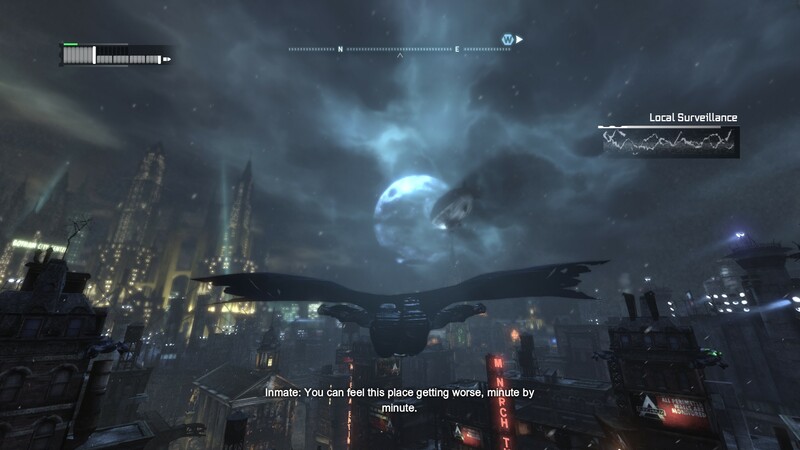 Batman can use his line launcher to grapple through Arkham City and that’s really cool. 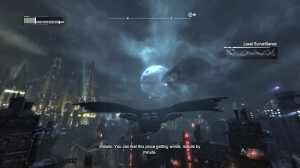 You can even get an upgrade to get extra power to catapult you of edges and then glide on through the streets of Arkham. Pretty slick if you ask me, could do that for hours. To make it clear, I played on a PC. With that out of the way: It’s great! Just great! The graphics may not be top notch but they look insane and fit right in with the overall design, characters, environments, I liked all of it. Well, I still think there are too many muscles on those goons, and on Batman. A tiny bit over the top. Sound design is also very good and while I only had the german voice acting, they managed that pretty good as well. They got the german voice of Batman from the Nolan movies and everybody else is unknown to me but delivers nonetheless. The english Joker was voiced by Mark Hamill, I’d like to hear that but haven’t yet managed to switch languages in Steam. As for the controls, I already said they’re quite easy to learn but they do in fact use many keys on the keyboard and that can get fiddly in combat which is all about the right timing. E.g. you can quickly use tools like the Batarang and Batclaw in combat by double tapping the dedicated number keys. Pretty neat. Oh, the Direct X 11 support shall be buggy, but since I’m not familiar with what that would accomplish I’m not sure what I missed there, so no bugs for me.